This crucial metal is drawing Wall Street’s attention. 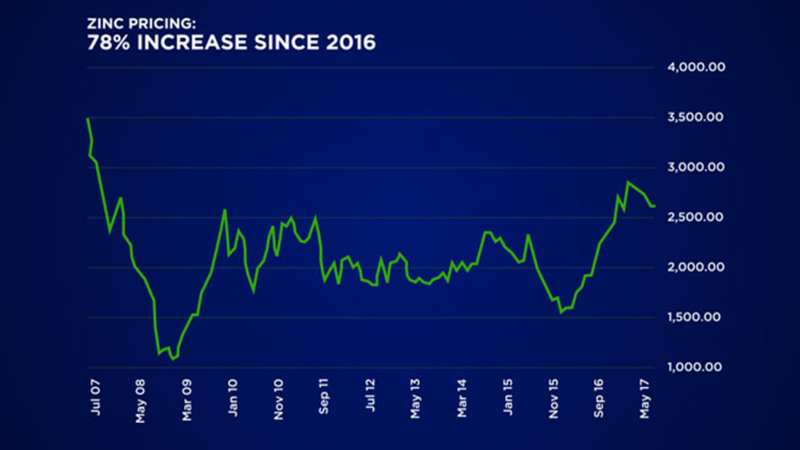 Zinc prices are primed for a boom because supply is depleting at an alarming rate due to mine closures and production cuts in the midst of growing demand. Thus, giving smart investors a rare opportunity to get in this epic bull market. Zinc is one of the most important metals that we take for granted. It’s also one of the least followed by investors, unlike gold. Zinc is essential for rustproofing steel and is used for a variety of infrastructures such as auto bodies, bridges, as well as oil, gas and power-generation. They’re also being used to produce batteries, fertilizers, paints, plastics, cosmetics and multivitamins. Every building, car and other steel products are galvanized with zinc coating because of its anti-corrosion properties.This makes it highly valuable and sought after by countries concentrated on infrastructure development. Zinc is the fourth among all metals used for global production and its demand is predicted to grow at 2.4% over the next few years. Almost 90% of zinc is consumed through industrial usage, and 50% of global demand is attributed to China. However, the recent closing of two major zinc mines, Century in Australia and Lisheen in Ireland, and additional production cuts from Rampura Agucha in India, Antamin and Iscaycruz in Peru as well as Glencore and Nyrstar have disrupted the supply of zinc. Now, there is far greater demand for zinc than supply, which in turn will drive zinc prices up drastically. The bull market for zinc started back in 2004, when supplies began to fall. The chart below shows that the cycle is repeating itself. Zinc supply is barely keeping up with growing demand, and the bull market for the industrial metal is just heating up. More and more countries have expressed plans for infrastructure growth and expansion. China’s Belt and Road Initiative plans were already put into action, and now America and India have similar goals for development. China, the world’s red dragon, is in the midst of emerging as a first-world nation and part of its growth requires rapid development in many cities and areas. 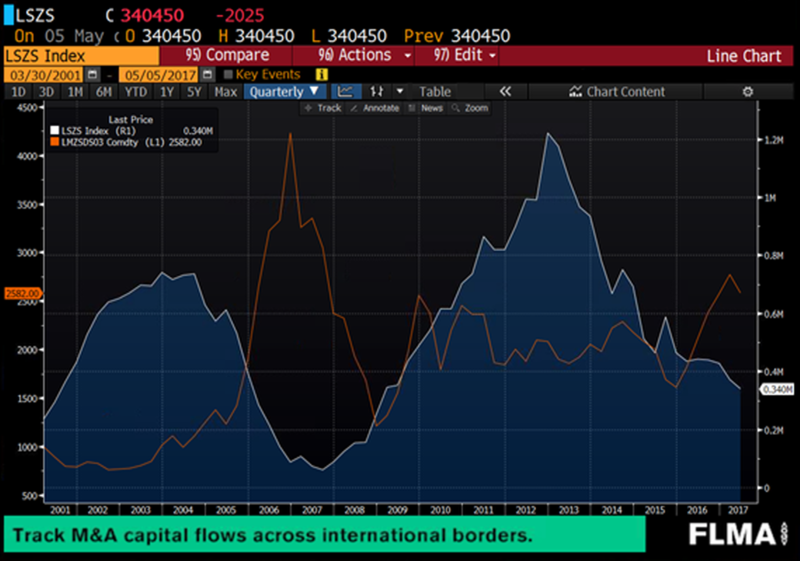 China has spent more on infrastructure than both US and Europe combined, raking close to about $11 trillion in the last decade and is responsible for 47% of the world’s total demand for zinc. China’s urbanization is the primary driver of economic growth and is not set to slow down anytime soon. Trump has announced his vision and America’s plan to become great again by having infrastructures “second to none”. His US$1 trillion infrastructure policy resembles China’s current infrastructure development plans, but on a smaller scale. Trump’s plan offers to support job creation in the short run and expanding the economy’s capacity. With these two power player countries in quest for rapid infrastructure, raw materials will be in high demand. Zinc is foreseen as garnering the highest demand, especially since supply has dwindled down in the past two years. Due to a limited number of suppliers for zinc to be used in every step of the development and building processes, zinc prices have doubled to over $2600 per tonne. Financial experts believe this number will continue to surge, especially since India also expressed interest in growing their infrastructure development. Zinc prices skyrocketed over 78% since 2016 because demand was greater than available supply. The biggest gains ever recorded happened in the last two years when Zinc’s prices increased by 286%. The best gains are yet to come, and now you have the chance to invest in it alongside a proven mining veteran backed by a technical and financial team with decades of experience in the industry. One of the most anticipated companies to watch out for. Zinc One (TSX-V:Z; OTC:ZZZOF) is a Vancouver-based company with a focus on the acquisition, exploration and development of world-class zinc projects. The company recently acquired Forrester Metals in an $18 million cash and share deal, allowing them to acquire the Bongara Zinc Mine and the Charlotte Bongara Zinc-Oxide Project. It's the first time the two projects have been controlled by a single operator and thus offers a unique opportunity to delineate a substantial high-grade, zinc-oxide resource along a 4 kilometre-long trend, states Zinc One. "Anyone who wants to participate in an exploration and development company that's focused solely on zinc – brownfield zinc – needs to research Zinc One. What we're really trying to do is get into production as soon as we can," said president and CEO Jim Walchuck, on the phone with MINING.com. "It's an extremely high-grade deposit, we have yet to find one that's better, sitting on surface." Located in northern Peru close to Ecuador, Bongará was discovered in 1974 and since then various companies have completed exploration programs. The mineralization is seen along approximately 4 kilometres. Bongará was mined in 2007 and 2008 by open-pit methods. The material was semi-dried at the site, and then shipped 540 kilometres to the coast where it was processed through a Waelz kiln, a processing technology typically applied to flue dust from steel mills to recover zinc. Recovery grades of over 90% are shown in this past production. A greater than 60% Zn calcine was made and sold to refineries in Peru and the United States. A sinking zinc price was the principal reason for shutting down the mine in August, 2008. 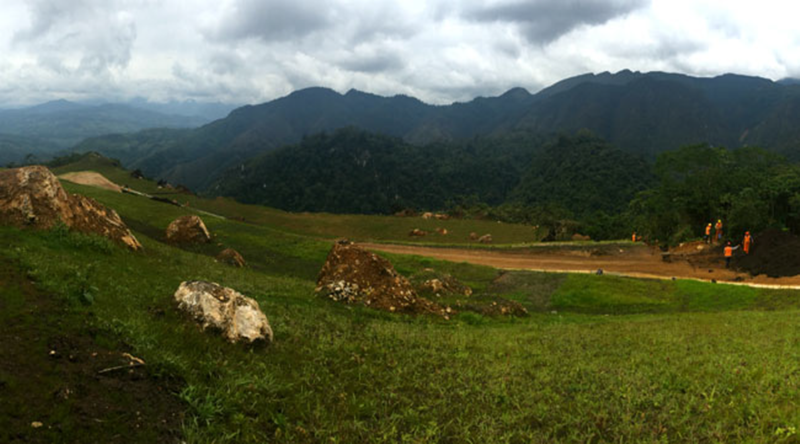 Bongará has a measured and indicated resource of 1,007,796 tonnes at 21.61% zinc and an inferred resource of 209,018 tonnes at 21.18% zinc, based on the latest resource estimate done in 2011. Between 2007 and 2008 the previous operator, Pascamayo, produced 55.1 million pounds of zinc, running at 358 tonnes a day. "The beauty of this deposit is the grade," says Walchuck, a 37-year mining veteran whose resume includes mining manager for Barrick Gold (TSX:G,NYSE:GG) at the Bulyanhulu Gold Mine in Tanzania from 1999 to 2002. The management team includes director Greg Crowe, a geologist with 35 years of mining experience including as president and CEO of Silver One Resources and Entrée Gold; Barry Girling, who served as director of Burkina Faso -focused Roxgold Inc.; and Gunther Roehlig, who has 20 plus years experience restructuring and financing junior public companies. Walchuck said he's looking to bring former members of Forrester Metals into the management fold, including their VP Exploration, and CEO Bill Williams, a PhD-level geologist who has worked in Peru for over 10 years. "I don't have to build a team. I have a team already in place and it's going to work really well," he said. 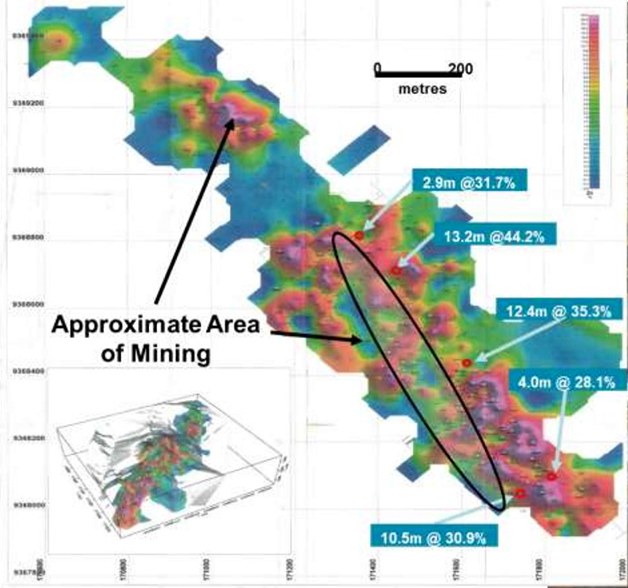 The Bongara Mine Project will see an upcoming drill program of up to 300 shallow drill holes on zones of known mineralization as well as test zones. There is over 4km of potential strike including follow up on the high grade drill intercepts on the adjacent Charlotte Bongara project. This is the first time the Bongara Mine Project and the Charlotte Bongara project have been owned by the same operator. Another promising aspect of this project is the fact that there is no need to excavate deep underground, the Bongara Mine Project is on surface and amenable to open pit mining. Bongara’s 20%-25% zinc is worth about $600/tonne rock at current zinc prices. Inside these two great project sites, the zinc-oxide mineralization continues towards an exploration area known as Campo Cielo, where the trenches have exposed additional high grade, zinc-oxide mineralization. 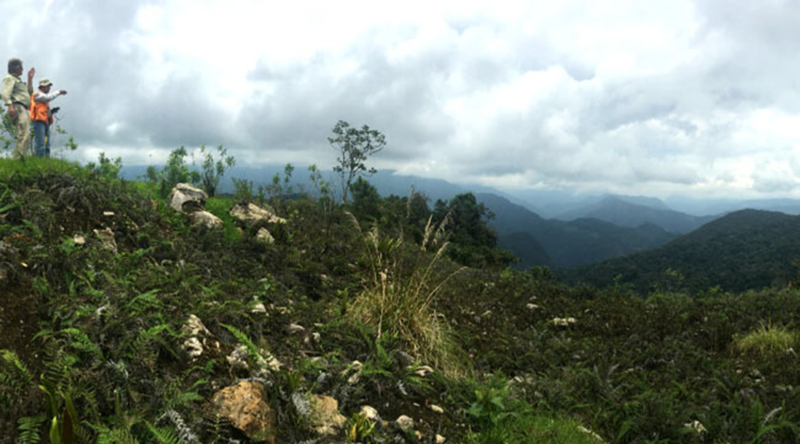 Zinc One will also acquire the Azulcocha West Zinc prospect in central Peru with over 8,000m of drilling completed and several additional targets. Zinc One feels with with tighter drill spacing, some deeper drilling, and more comprehensive measurement and prudent application of the specific gravity used for the historical resource estimate, the measured, indicated and inferred resource will be increased. Thus, makes it a huge asset for a company with a market cap of just C$35 million. The major power-player countries are on the move towards infrastructure expansion and development. This will be the ultimate driving force of the world’s economy, and demand for raw materials will surge. While there are other minerals and raw materials needed to achieve these policies and plans, there is limited supply for Zinc because of the mine and company closures in the past few years. Bloomberg made Zinc One of 2016’s Top Bets due to the deepening deficit which experts estimated that deficit will be bigger than it was in 2005 making Zinc One’s past producing, high-grade zinc mine a prime target to be put back into production. DISCLAIMER: The information in this newsletter does not constitute an offer to sell or a solicitation of an offer to buy any securities of a corporation or entity, including U.S. Traded Securities or U.S. Quoted Securities, in the United States or to U.S. Persons. Securities may not be offered or sold in the United States except in compliance with the registration requirements of the Securities Act and applicable U.S. state securities laws or pursuant to an exemption therefrom. Any public offering of securities in the United States may only be made by means of a prospectus containing detailed information about the corporation or entity and its management as well as financial statements. No securities regulatory authority in the United States has either approved or disapproved of the contents of any newsletter. Newsmax nor Native Ads Inc. is not registered with the United States Securities and Exchange Commission (the “SEC”): as a “broker-dealer” under the Exchange Act, as an “investment adviser” under the Investment Advisers Act of 1940, or in any other capacity. Employees of Newsmax nor Native Ads Inc. are also not registered with any state securities commission or authority as a broker-dealer or investment advisor or in any other capacity. This piece is an advertorial and has been paid for by Native Ads Inc. One of the Native Ads Inc. owners does own shares in Zinc One. Zinc One has hired Native Ads Inc. to create informational content and this advertorial. This document is not and should not be construed as an offer to sell or the solicitation of an offer to purchase or subscribe for any investment. No information in this Report should be construed as individualized investment advice. A licensed financial advisor should be consulted prior to making any investment decision. We make no guarantee, representation or warranty and accept no responsibility or liability as to its accuracy or completeness. Expressions of opinion are those of newsmax.com only and are subject to change without notice. Newsmax.com assumes no warranty, liability or guarantee for the current relevance, correctness or completeness of any information provided within this Report and will not be held liable for the consequence of reliance upon any opinion or statement contained herein or any omission. Furthermore, we assume no liability for any direct or indirect loss or damage or, in particular, for lost profit, which you may incur as a result of the use and existence of the information, provided within this Report.